Now that March is almost upon us, I think it’s important to talk how how to transition your wardrobe from winter to spring. Spring time is honestly one of my favorite seasons of the year. The days get longer, you can wear less clothing (no more heavy jackets! ), cute shoes are back (goodbye UGGS! ), and it’s finally time to get out of that neutral clothing rut and incorporate some color into your wardrobe! This knit sweater I got last year from H&M is such an amazing dupe for this expensive knit sweater by Ganni (retails $475). I love how soft and cozy it is but with the reasonable price tag! 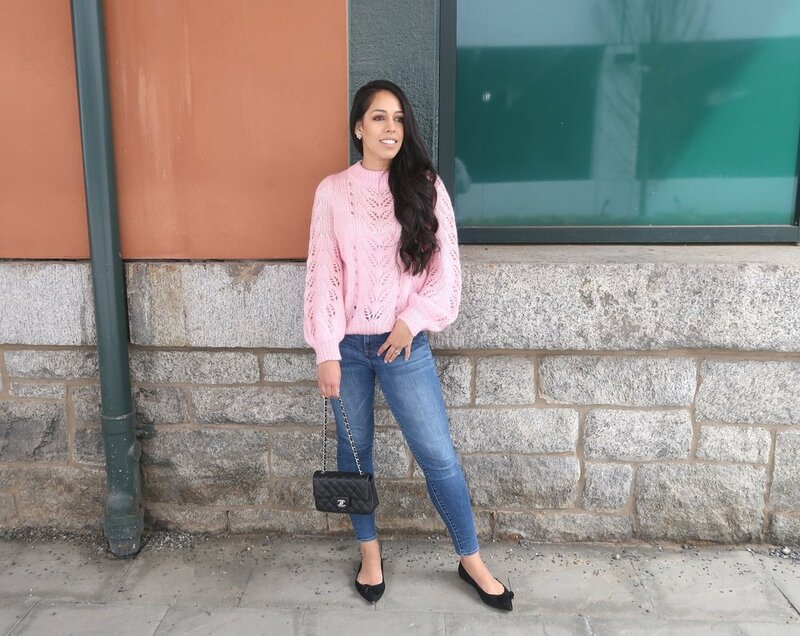 Another reason I love it is because it just screams “spring!” Knits are one of my favorite pieces to keep in my closet from winter, to spring and then to fall because it transitions so easily from each season. Pair a lightweight knit with a simple pair of jeans or try wearing it a new way instead with a maxi skirt or culottes! I love the contrast of pairing over-the-knee (OTK) boots with a short dress. Essentially the OTK boots are re-placing your leggings/tights. It’s finally time to show some skin and let those legs feel the warmth of the sun! Layering is the name of the game especially in the springtime when the weather can be so unpredictable! Utilize trench coats and light cardigans to elevate your looks. You can also use these pieces as the “statement” piece of your outfit so have fun with it! Shoes are a fun way to bring some color into your life and to show your personality. For spring, I suggest investing in an open-toe bootie (time to show off that pedicure!) or a fun pair of flats. 5. Re-Wear Winter Friendly Staples. Find new ways to pair fresh spring pieces with winter-friendly staples as the weather during the spring can be quite unpredictable. 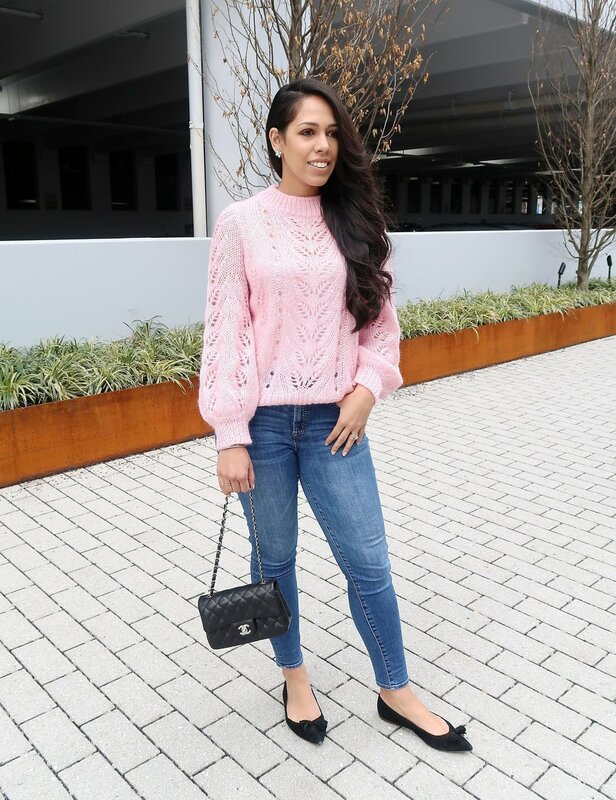 I always like to opt for layers or a thicker material (such as a knit sweater) and then something fun (how I paired this look with a knit, jeans, and flats!). It’s like shopping in your own closet! Shop some of my favorite knit sweaters below! With spring just around the corner, I've been majorly crushing on a couple of trends and have been seeing them everywhere! I am excited for the warm weather and absolutely cannot wait to rock these trends! Here are My Golden Beauty's Hottest Fashion Trends of Spring 2014. White, pink, blue, mint, violet, coral - These are the hottest pastel colors out there. Don't worry, you won't feel like the Easter Bunny. Designers have gotten pastels right and have done these colors so gracefully. Pastels are definitely one of the hottest trends right now for spring. Pair with jeans, skirt, white or black pants and these classics are updated and ready to wear for 2014. Crops tops are EVERYWHERE and are extremely popular for spring and celebrities everywhere have been sporting crop tops everywhere, especially Kim Kardashian. Crop tops are best paired with a midi skirt. Midi Skirts are youthful and when done right, look very modern. I would recommend pairing a midi skirt with a crop top or a tucked in top so that it accentuates your waist and offsets the length. Alright ladies, pleats are making a HUGE comeback. Of course pleats have been around for quite a while but it's good to know how to update this old trend. Make sure pleats aren't too "puffy" and also either wear with a tucked in shirt or a crop top to accentuate your waist! I LOVE collarless jackets. Collarless jackets are timeless and for the springtime they are perfect for those chilly spring nights. This trend will be staying around for a while. It's best to stay safe with a neutral or solid color, but it's always fun to take a risk with bright colors and prints.